If you plan on coming out to the desert for Coachella Weekend One, then this is the list you want to remember. 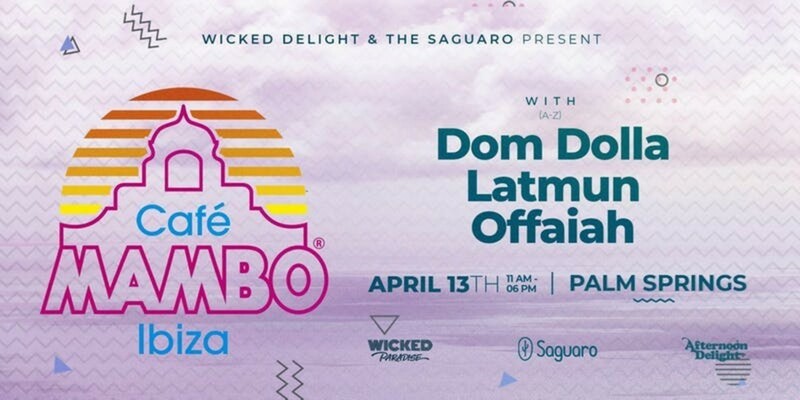 Brace yourself, the Coachella Valley is getting ready for one of the biggest music festivals on the planet and with such a massive festival comes a tsunami of amazing exclusive events, parties and activities scattered outside of the Coachella walls. Continue reading to enrich your party soul. 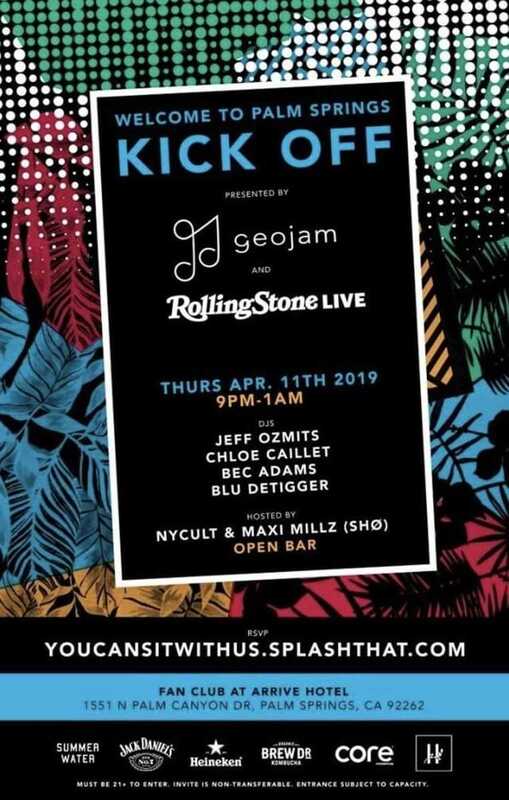 The Thursday night kick off party has been resurrected once again as Geojam and Rolling Stone Live present the "Welcome to Palm Springs Kick Off" party located at the Fan Club inside the Arrive Hotel. The night will be filled with special guest DJs Jeff Ozmits, Chloe Caillet, Bec Adams and Blu Detigger as guests will be treated to an open bar to make sure that Thursday night&apos;s kick off goes off with a bang! Remember you must RSVP, which does NOT guarantee entry, so make sure you go early! the Ace Hotel&apos;s Amigo Room is about to blow up!!! 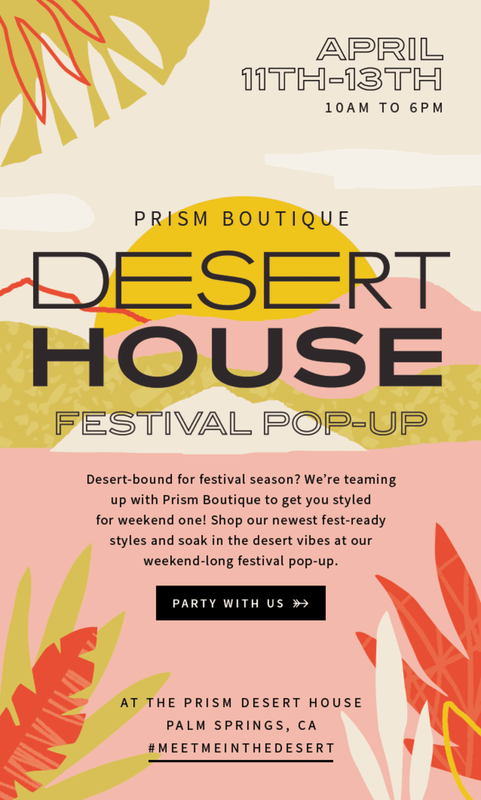 Prism Boutique will be popping up in Palm Springs to trick out both the festival bound and those visiting for the party weekend. Open to public, the Prism Boutique will be offering choice selections from favorites Matisse Footwear, L*Space, Novella Royale, Daydreamer, Jurate Brown and Le Specs, to get the best desert festival looks. Thursday starts the weekend off early, and then things really kick in to gear on Friday with mini makeovers from 12-4pm with Pixi Beauty and hydration-boost facials from Skin Laundry. On Saturday your hair strands get all the attention with festival styling from 12-4pm from Salt Strands while discounted festival lashes from Pop Lash & Beauty Bar will also be available. Throughout the weekend, enjoy cocktails from Our/Los Angeles Vodka and Los Sundays Tequila, wine from Summer Water Rosé and One Hope Wine, and Calidad Beer, plus non-alcoholic refreshments from Health-Ade Kombucha and Liquid Death Water. the vestal village rises again... good times are coming soon. Psst... did you know that located south of the shops, restaurants and stores of the Indio Valley there lies a magical place that pops up every Coachella weekend? This place is a land filled with bikini rockin’ hotties and hard bodied fellas. A place where live music and djs play all day and the drinks flow and flow. This land is the VESTAL VILLAGE. Like all things amazing during Coachella weekend, this magical mini-festival is only accessible with an invite. That invite unlocks the gates to one of the largest pools in the valley, complimented by a lake with the village spread around the field, starting on Friday and ending on Sunday. Inside the village, guests will find many different kiosks and tents that range from beauty touch ups, clothing and swimsuit options (for those that can’t pack appropriately), Vestal sunglasses and watches and much more. Located near the lake is the food court filled with various options to appease the gastric cravings, while all around the pool, satellite bars serve the alcoholic nectars that keep everyone’s tipsy energies on fire. For those die hard Vestal Village fans, camping setups are also available with sign ups starting on Thursday. If you don’t have an invite or a secret passcode to RSVP, you can try your luck and plead your case to the Vestal Village gate keepers through the rsvp link below. Studeo is bringing back the Festival Fitness Club which will kick off Friday morning starting at Arrive Hotel. This hike will start at 9:00 AM so make sure you&apos;re on time. This year the hike will return to the Tahquitz Canyon which will be breathtakingly filled with this year&apos;s super bloom!!! Complementary food and refreshments will be served but remember, you must RSVP, which does not guarantee entry so get there early. is that a mirage? no it&apos;s the ZOEasis promising an experience of bliss. The return of the ZOEasis means another night of couture, luxury and fun with fashion maven Rachel Zoe and friends. 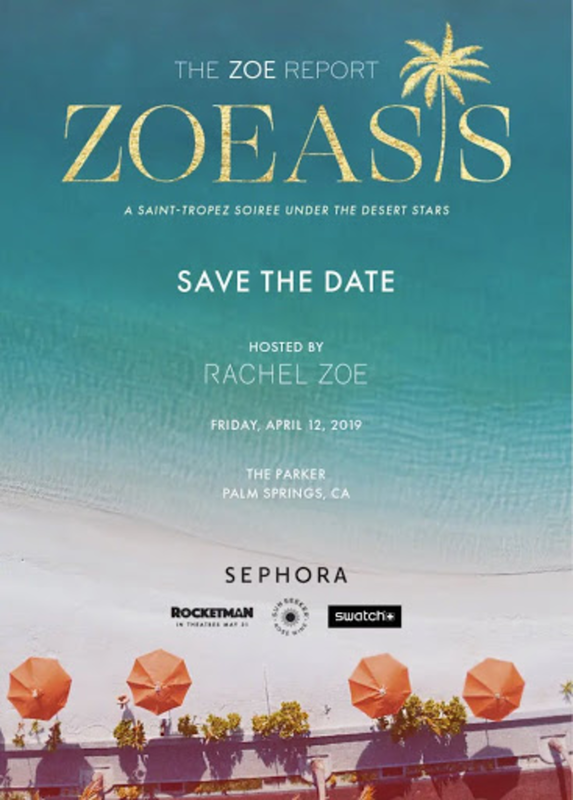 Located within the luxurious iconic grounds of the Parker Palm Springs, on Friday weekend one, the ZOEasis will undoubtedly be one to be at. Details are still coming in but to get an idea of what stylish shenanigans go on, check out our recap from our last visit at the ZOEasis (here). 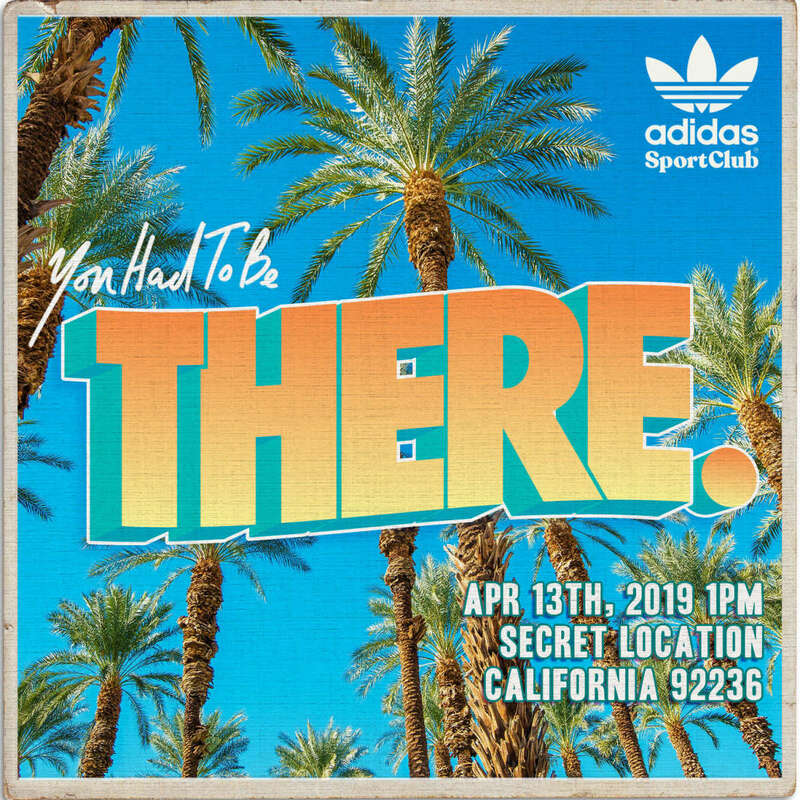 Adidas Sportclub is coming to the Coachella Valley with a two-day event at an undisclosed location which promises to be a memorable one. 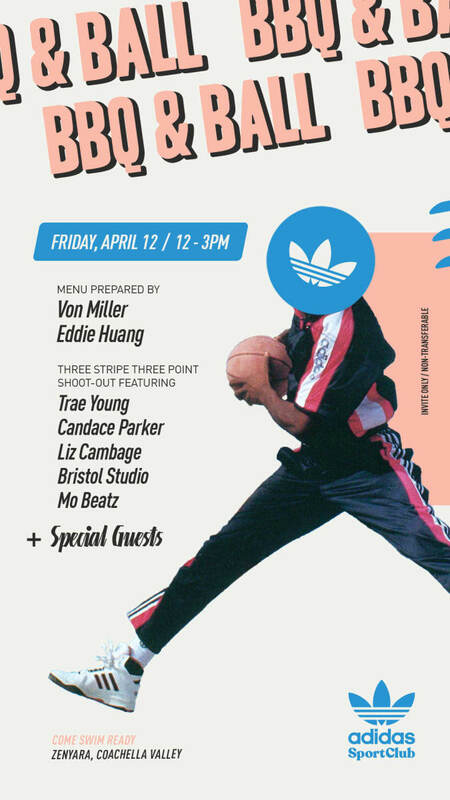 Kicking things off will be a star studded bbq on Friday, featuring a curated menu by Von Miller and Eddie Huang as guest spectate on a "Three Stripe Three-Point Shootout" featuring Trae Young, Candace Parker, Liz Cambage, Bristol Studio, Mo Beatz and other special guests. 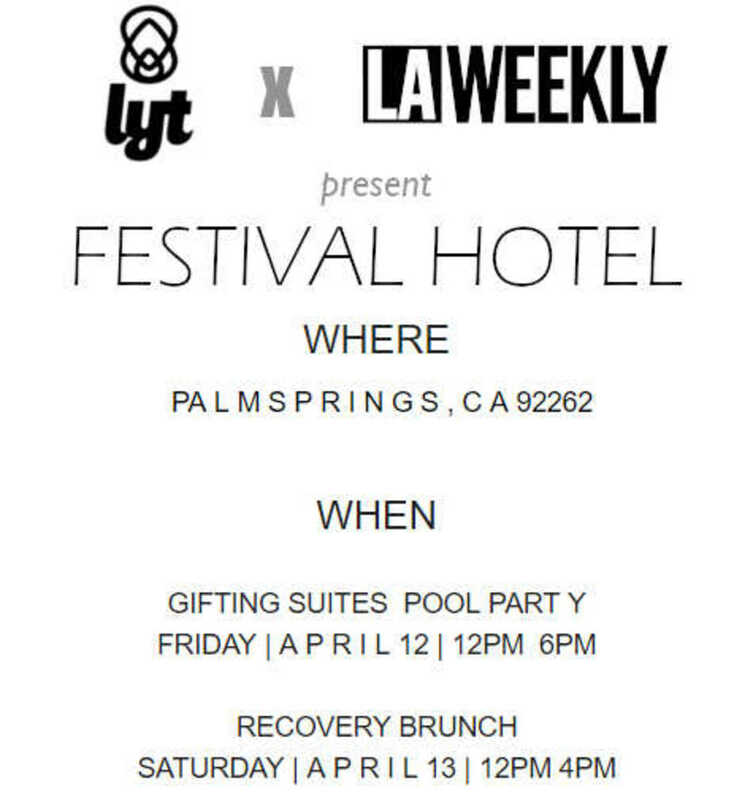 Weekend one continues to shine as LYT and LA Weekly join forces to bring the Festival Hotel on Friday and Saturday. LYT, officially launching in May, is the first and only mobile dispensary offering personalized cannabis concierge experiences with a focus on lightning fast service and will be on-site as a special preview of what to come. This invite-only hotel will kick off the weekend with its first ever cannabis competition with specialized cannabis education from industry experts, free tattoos from Heavy Hitters and a relaxing meditation box from LYT. Guests of the hotel will also be showered with deliciously crafted gin libations from Beefeater, delicious eats from Chef Mikail Sayeed, free crystal and sound therapies from the Miage Skincare tent, whimsically adorable pool floaties by Sunnylife, and lovingly crafted drinks from Je Suis Coco, to keep the day long buzz going. Saturday will treat guests to a recovery brunch with of course more libations and fun, to keep it all going until the evening. beglammed for a weekend of music in the middle of the desert. 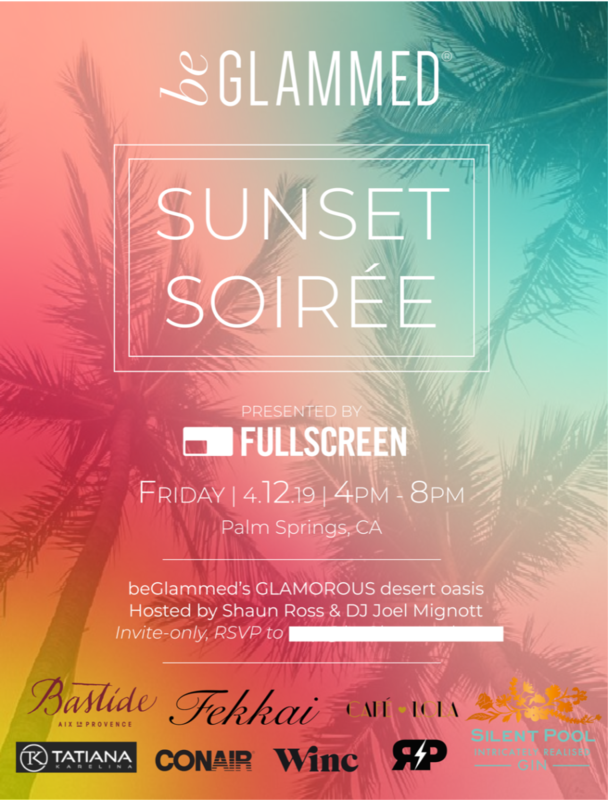 Friday evening, weekend one, is set a blaze with the highly anticipated and sought after beGlammed Sunset Soiree presented by Fullscreen, where invited guests are set to be "glammed and pampered" in preparation for the biggest music festival in the world. Upon entering, guests will be offered a full suite of complimentary services (Braid Bar, Custom Temporary Tattoos, Ear Piercing, Glitter Glow Bar, Hand Massages, Jewelry Counter, Lash & Lip Bar, Makeup Counter, Manicures) and music poolside, along with a VIP gifting suite stocked with premium beauty brands, hosted rose and liquor bar, lite bites and treats, charging stations and more. Unfortunately entry is invite only. 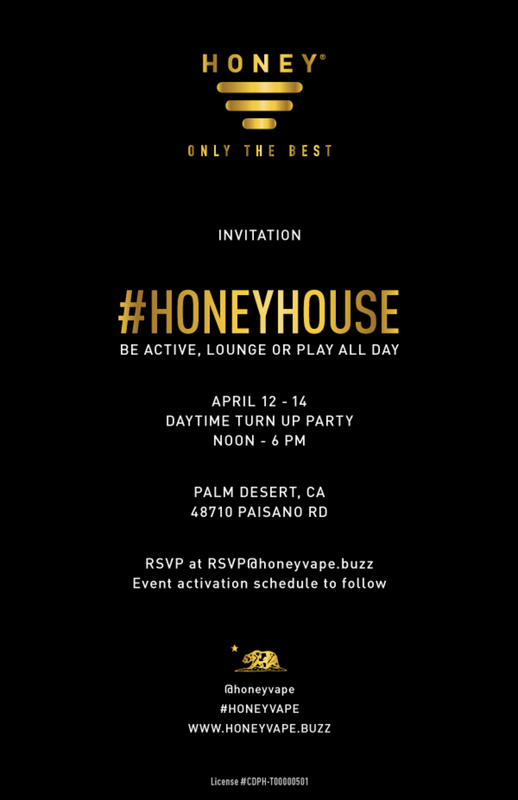 The honey has never been sweeter than it is in the desert as Honey Vape opens the doors to their Honey House for a three day event that will allow guest to enjoy how sweet it all is. Situated in a palatial estate tucked away in the Cahuilla Hills of Palm Desert, all it takes is an RSVP to enjoy a weekend of lounging or playing all day long. Guests will be treated to yoga, meditation and reiki sessions while refreshments are served by Splash Premium Mixers. Feeling a little inept on your Instagram content? Honey House offers some of the best views for any influencer or influencer-in-training to fill their Insta with breathtaking imagery. Don&apos;t forget your swimsuit...pool parties are a must and will be going on all day long. RSVP BELOW to unlock your chance to honey it up at the Honey House. Vampped returns with another exclusive pool party event located on one of the most luxurious estates within Bermuda Dunes. As you walk around the snaking pool guests will be surrounded by multiple pop-up and gifting experiences, photo booths along with a special Harley Davidson Man Cave activation filled with custom merchandise and the all new electric motorcycle. Sugarbear Hair will also be on-site providing pop-up hair salon. This event is so huge, SPIN electric scooters will be around for guests to get from point A to point B. If you&apos;re thirsty, you have nothing to fear as a small army of mixologists will be crafting drinks for all. But wait there&apos;s more!!!! Located in the estate&apos;s personal airplane hangar, recording artist 3LAU & Charly will be performing! YOU DO NOT want to miss this. To RSVP, click the link below for a chance to be considered for their guest list. Good luck! 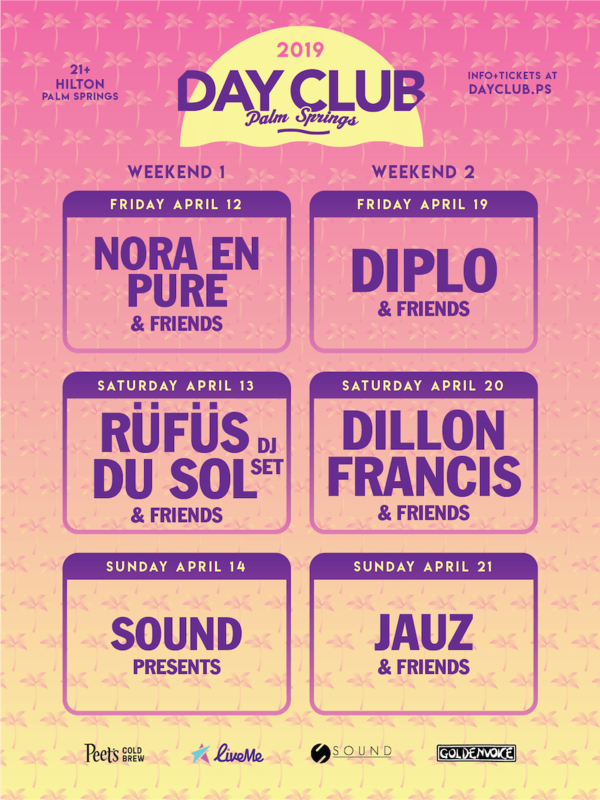 Las Vegas nightlife titan TAO Group has teamed up with Revolve once again to bring back the REVOLVE festival after hours on Friday night of weekend one. Sadly this year, Desert Nights will be a one-night invite only event but promises to be filled with special surprise performances by the hottest chart busting artists coupled with epic sets from the top DJs headlining across the world. This friday night is guaranteed to go until the break of dawn so bring your dancing shoes! DATE: April 12, 2019 / TIME: ??? / LOCATION: ??? Nylon Magazine and "Booksmart" have teamed up this year to bring back the Midnight Garden Party. 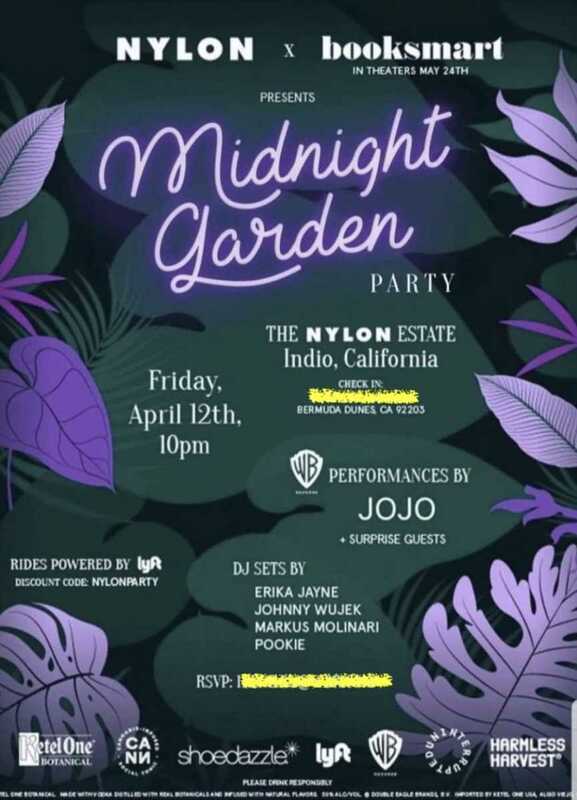 This Invite-Only event will be located at the Nylon Estate featuring a live performance by JOJO and other surprise guests as DJs Erika Jayne, Johnny Wujek, Marcus Molinari and Pookie take over the decks. Attendees will be showered with crafted Ketel One cocktails as they dance into the night. THERE IS NO PARKING at the Nylon Estate so it would be best if you took a Lyft to and from. An amazing line up for the KROQ mini-festival pool party!!! 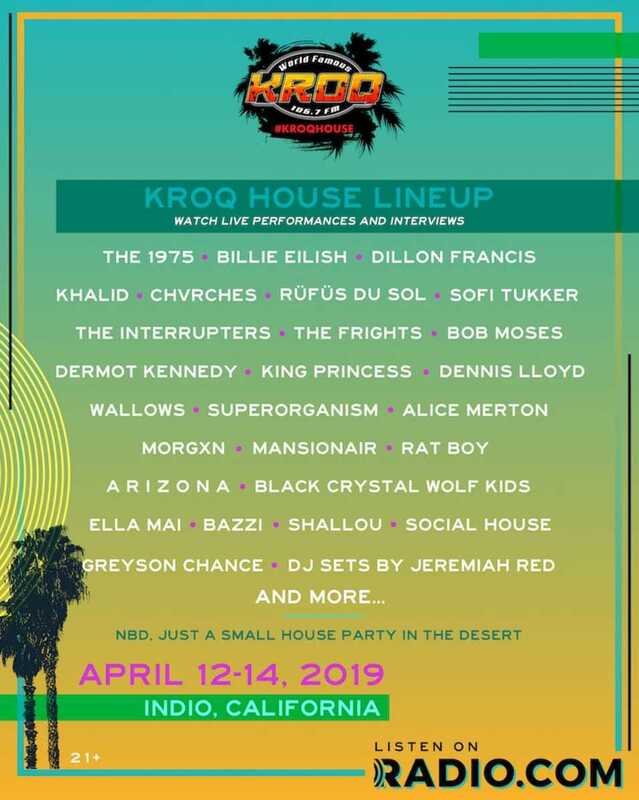 KROQ radio is returning with their annual mini-music festival pool party at an undisclosed location. DJ Jeremiah Red will be serving it up poolside as special live performances by some amazing artists will go down all 3 days long. Sadly this is strictly an invite only event BUT if you&apos;re lucky and a KROQ listener, you might be able to win some passes. Tune in for a chance to win! Get ready to be pampered, mingle with your favorite influencers and be inspired to take on the world! 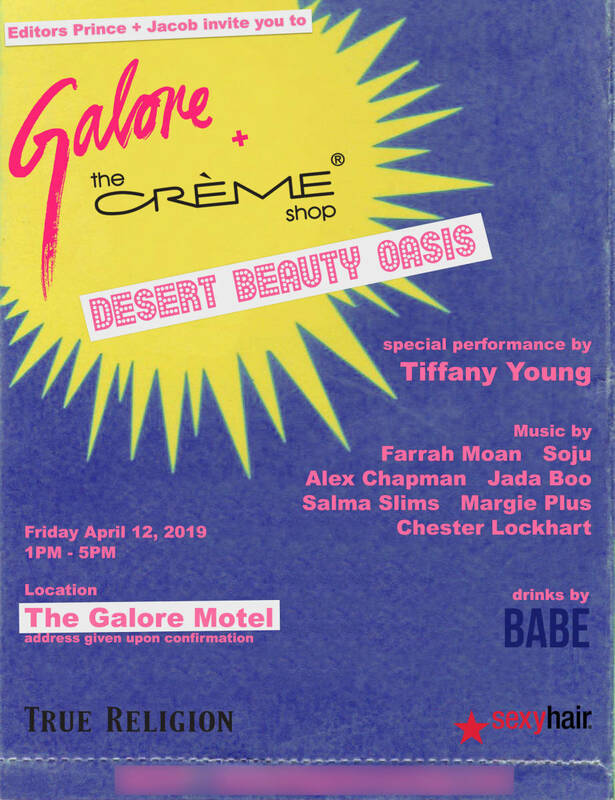 Returning to the Commune at the Ace hotel, the Create & Cultivate Desert Pop-Up will be a whirlwind day packed with beauty, fashion, cocktails and empowering panel discussions by beauty, fashion, and lifestyle influencers that are some of the best in the business. Between various fireside chats and keynote talks with the likes of fashion phenom Rocky Barnes and Tone it Up founders Katrina Scott and Karina Dawn, you&apos;ll enjoy beauty treatments, curated pop up shopping and end the day with a DJ fueled happy hour. Partners include Express, Supergoop!, Chameleon Cold Brew, Core, Not Your Father’s, Chandon & more! There is so much more we couldn&apos;t fit here, so check out the full schedule below. There are limited seats available, so RSVP as soon as you can. Doors open at 10 am, with the first 150 guests to receive a jam packed goodie bag of sponsored swag, so don&apos;t be late! so the real question is...are you feeling lucky...punk. Lucky Brand and Rolling Stone Live have teamed up to bring back the ever-so-popular Desert Jam for a 3rd year. 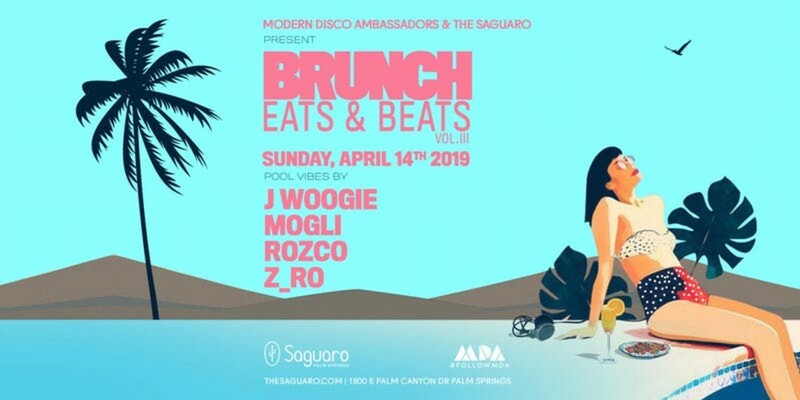 Located poolside at the Arrive Hotel in Palm Springs, guests will be treated to a plethora of activations, mini pop ups and various other surprises like the Wild Spirit Fragrances scent stations and the Foster Grant sunglasses kiosk. You know, to keep everyone smelling fresh and to keep the sun out of your eyes while you party in the desert. Heineken, Ciroc, Jack Daniel&apos;s, Summer Water, Core and Brew Dr. will insure that everyone attending will be hydrated and inebriated, while special performances by X Ambassadors, Jax Jones (our favorite! 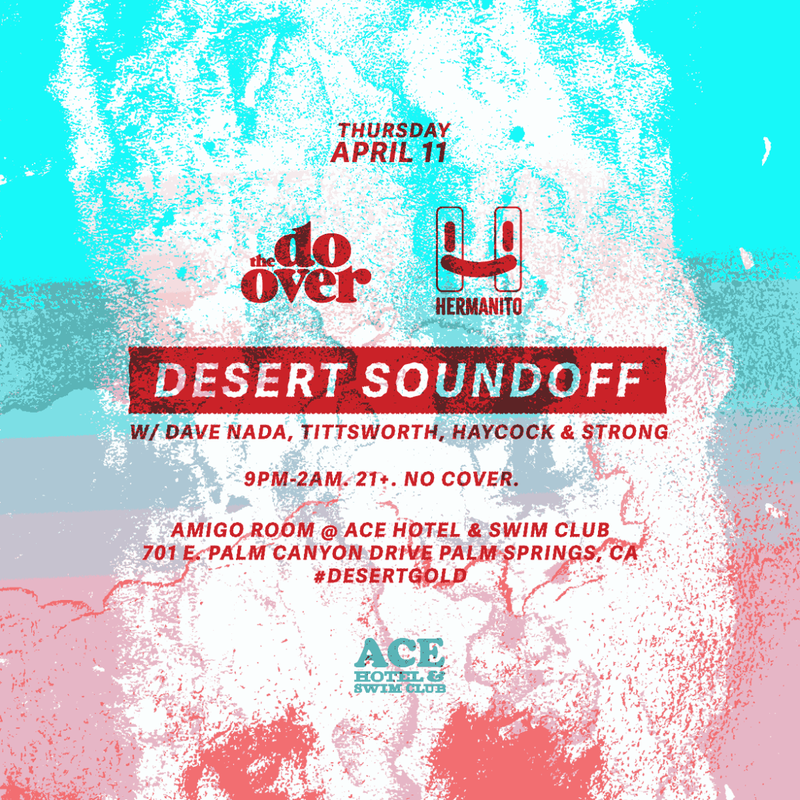 ), Ama Lou, Drax Project, Palm Springsteen and Jeff Ozmits will insure that the boogie will fill your bootays as you dance around the pool. Remember to pack sunscreen, your bikinis and board shorts because this party&apos;s going to be HOT HOT HOT! 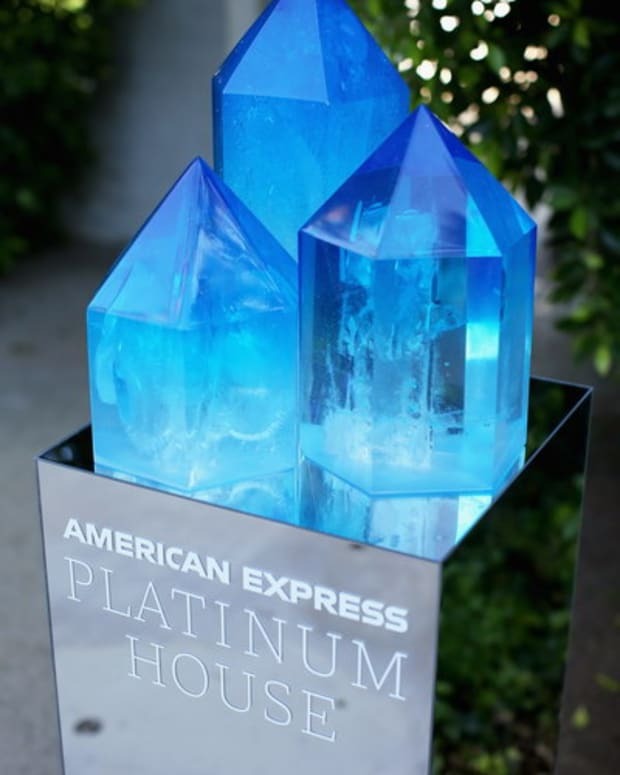 Another Coachella weekend and another return of the amazing American Express Platinum House where membership showers you with privileges. This year platinum guests will enjoy two days at the Avalon Hotel Palm Springs, surrounded by “follow me” immersive experiences created by “FriendsWithYou.” Guests will drown within prismatic sculptures, as they are drenched in joyful colors throughout the Platinum House. Curated cocktails from Centurion Lounge mixologist extraordinaire Jim Meehan will be readily available as passionately crafted bites from Chef Michael Solomonov will be devoured by all. Special guest DJs (to be announced) will deliver music to keep everyone grooving as Platinum House partner Equinox’s reimagined spa experience, EQX Body Lab, will be offering performance recovery-driven services such as express CBD-targeted massages, cryo-facials and targeted acupuncture from 12:00 PM - 4:00 PM daily. For the fitness minded, Equinox will also be hosting Palm Springs morning runs starting from the Platinum House, led by Precision Run Co-Founder and Creative Director, David Siik from 9:00 AM and 10:00 AM daily. And after the morning run, Milk Makeup will be providing highly pigmented, festival-ready beauty looks to the ladies (and some fellas). This year it won’t be all party party party as Platinum House will also host a dedicated bungalow for networking and on-the-fly meetings stocked with cold brew stations, DIY business cards and wifi printing stations from 9:00 AM - 5:00 PM daily. Sadly, entry into the Platinum House can only be had if you’re a Platinum Card holder because membership has its privileges. 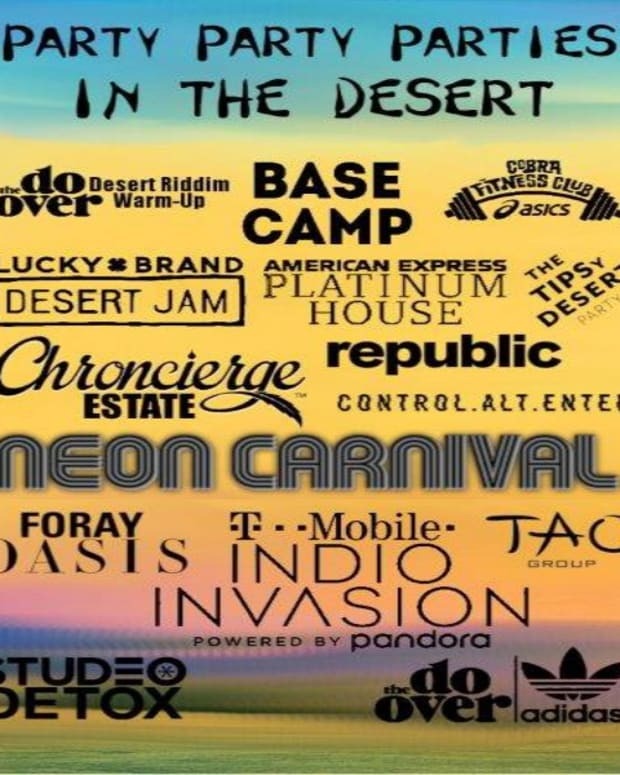 Get ready for the 5th annual T-MOBILE INDIO INVASION powered by Pandora. 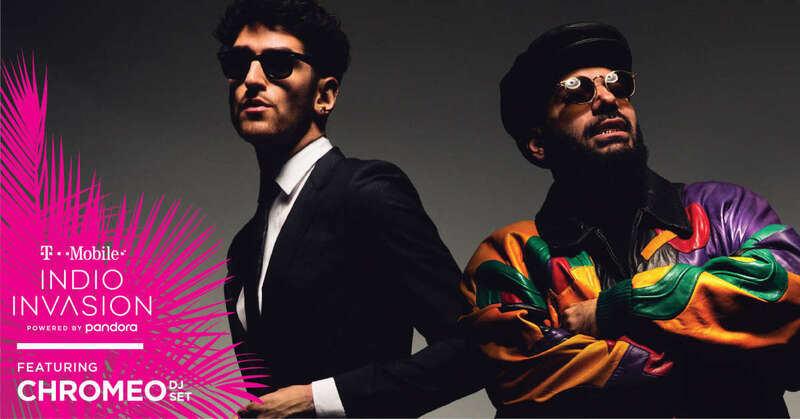 This free pool party extravaganza will once again be at the iconic Cree Estate in Cathedral City, CA with electro-pop-funk legends Chromeo serving up a DJ set that is guaranteed to keep all asses shaking. Get there early so you can secure your poolside real estate because it will be packed and you miss out on front row premium spots. WE HIGHLY RECOMMEND THAT YOU RSVP ASAP!!! Also, GO EARLY… an RSVP does NOT guarantee admission. Day two of the Adidas Sportclub will throw down with a uniquely special "You Had To Be There" event on Saturday. Details are still a mystery but we&apos;ve been hearing unconfirmed rumors that this will be a "no phones allowed" event, with the intention of guests ACTUALLY enjoying what the day has in-store. This will be refreshing in a drowned out world of selfies, social media and isolating "selfphoneism." The brightly lit behemoth rises again to dominate your Saturday night after hours. 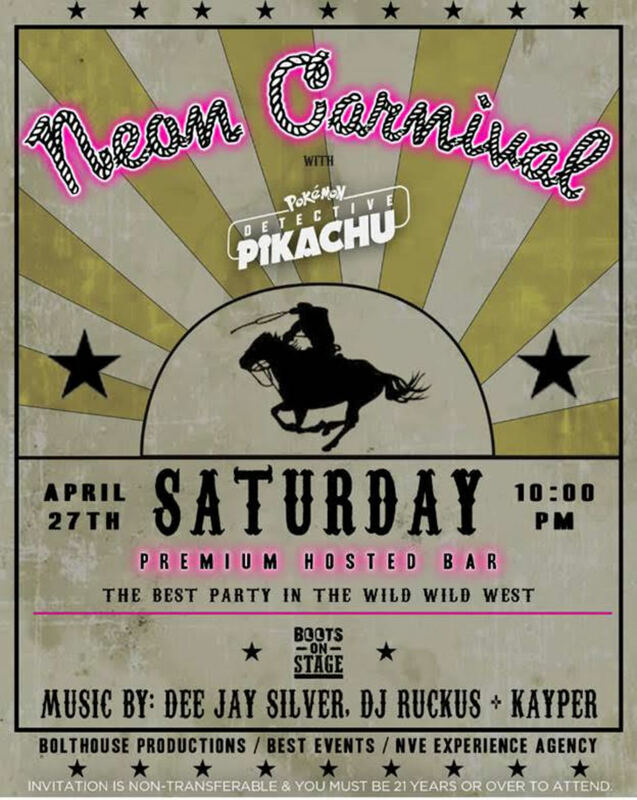 Brent Bolthouse’s Neon Carnival returns with another epic Saturday night of fun, frolic and folly in the middle of the desert! 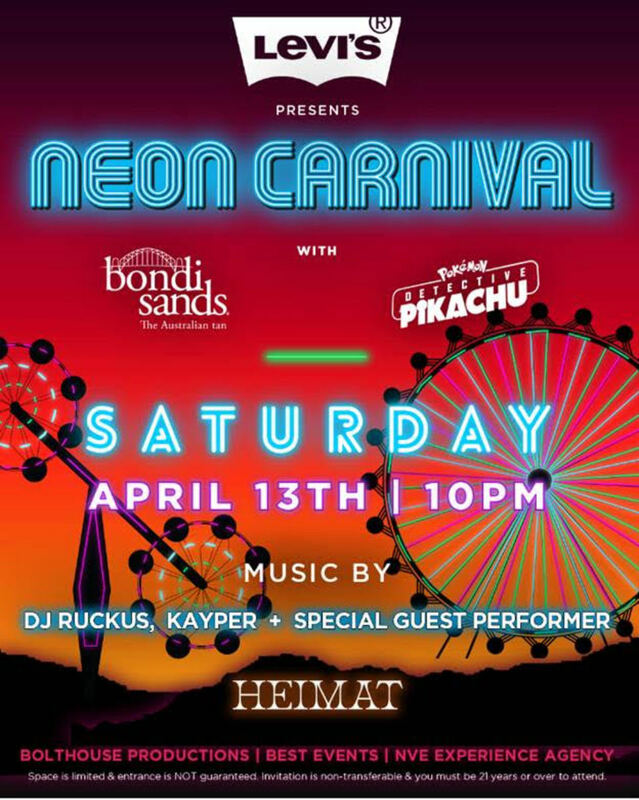 Levi’s Brand teams up with Bondi Sands and the new film “POKÉMON Detective Pikachu” to present the 10th Annual Neon Carnival, at the HITS Desert Park, for the most unforgettable after party during Coachella Weekend One. Invited guests will be able to enjoy the palatial new home of the Neon Carnival, which now resides on all-grass fields the size of three football fields. Returning will be a bevy of new midway games of skill where many exciting prizes can be won and a collection of hair raising carnival rides to keep everyone on the edge of their seats. Adding to this year’s excitement, Bondi Sands will be bringing a branded bumper car experience with photo booth, while “POKÉMON Detective Pikachu” will take over the signature ferris wheel and you’ll even be able to snap a picture with Pikachu himself. To keep party-goers refreshed, Golden Road Brewery will be rolling in with their customized freight container which will serve up GRB’s most favorite brews, as Neon deck-veterans DJ Kayper and DJ Ruckus, along with special guests, will keep the crowd dancing all through the night until the break of dawn. Invited guests will have a pre-weekend wristband pick-up hosted by HEIMAT Los Angeles, who will also be starting up their Neon Carnival HEIMAT VIP lounge experience during the carnival on Saturday night. So now’s the time to call in those favors, hit up your friends in high places and get yourself invited to the biggest and the most coveted Coachella weekend after party of the year. Once again the Do-Over continues to be the best “closing” party for both Coachella weekends. Even after a weekend of non-stop dancing, drinking and everything else, the energetic crowds always come to turn the Ace Hotel&apos;s Commune Pool out. In keeping with Do-Over tradition, special guests are not announced and just show up on the decks. Last year one of the special surprise guests was the legendary A-Trak. Make sure to RSVP below and check this out before you hit the festival one last time or call it a weekend and leave the desert. 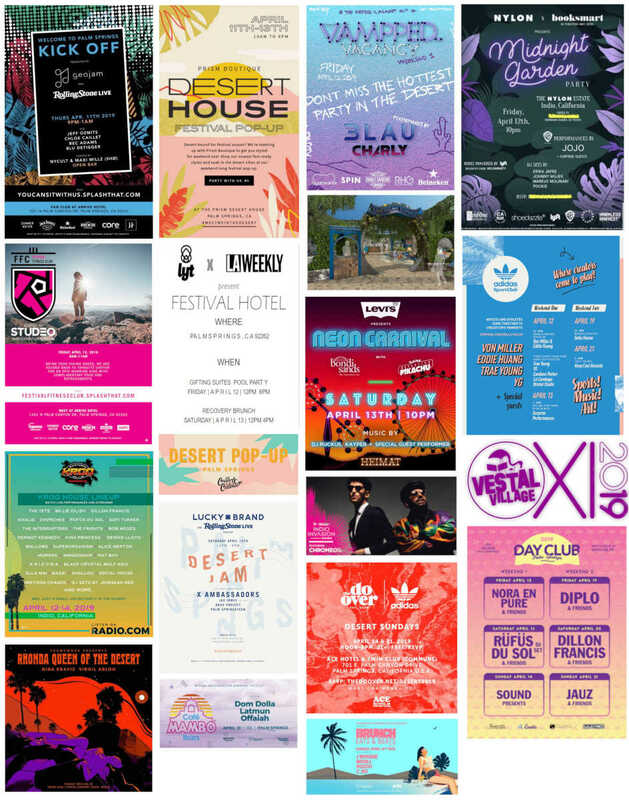 Below we have pooled together a comprehensive list of all of the "pay-to-play" events that will be happening during both weekends of Coachella. Ticket prices vary per event. let&apos;s get ready to RHOOOOOONDAAAAAAAAAA in the desert! membership has its privileges, even inside Coachella!!! 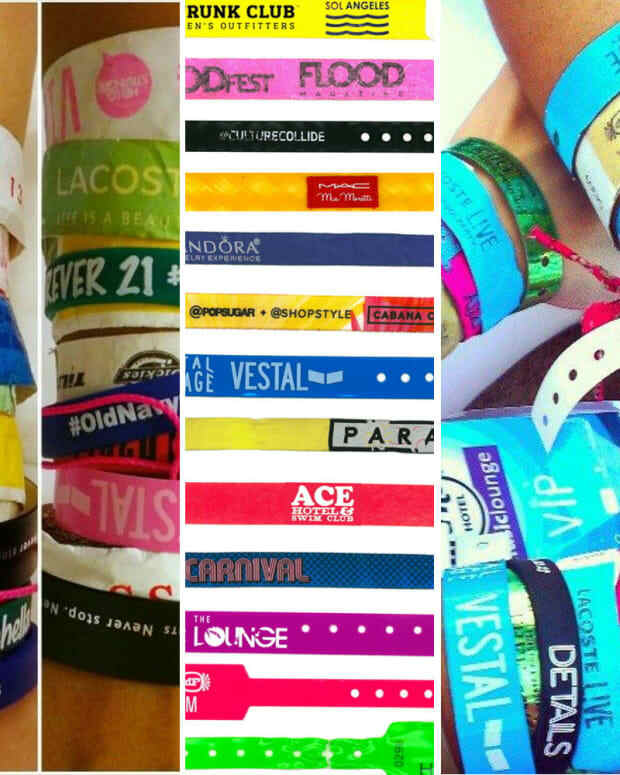 For festival attendees, membership has even more privileges! 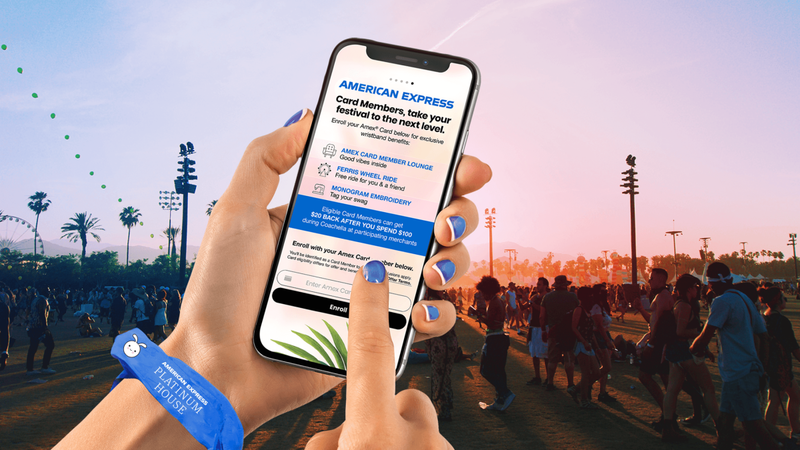 American Express Card Members will get access to the beloved Card Member Lounge, as well as other benefits when they link their eligible American Express Card to the Coachella app. The lounge live-space will transport fans to a world where they can live like their favorite Coachella artists before they step on stage. Additional services inside the lounge will consist of: nail art with celebrity nail artist Britney Tokyo (@britneytokyo), sneaker care cleaning service by Jason Markk, the world’s most trusted premium shoe care brand, exclusive artist merch available for purchase, charging stations, dedicated lounge seating, a bar and much more. 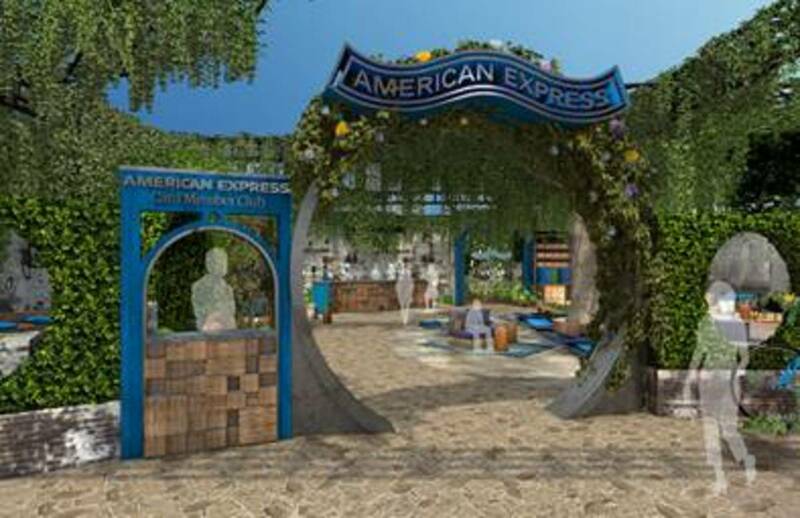 Also, once your American Express card is linked with the Coachella app, the privileges keep coming! 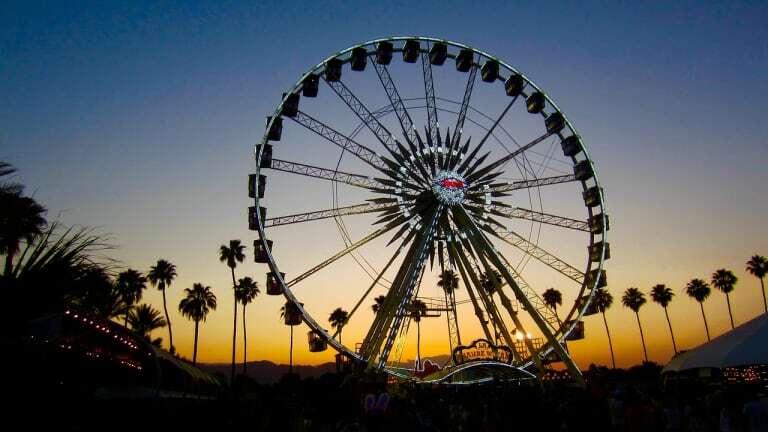 With the tap of your Coachella wristband, card members will get a complimentary Ferris wheel ride with a friend, a complimentary monogram embroidery on any one item in the Coachella Boutique or VIP area and (for eligible card members) you&apos;ll even get $20 bucks back when you spend $100 with your linked American Express card at participating merchants on the festival grounds. TALK ABOUT AAAAAAMAAAAAZING!!! (insert Oprah voice lol). 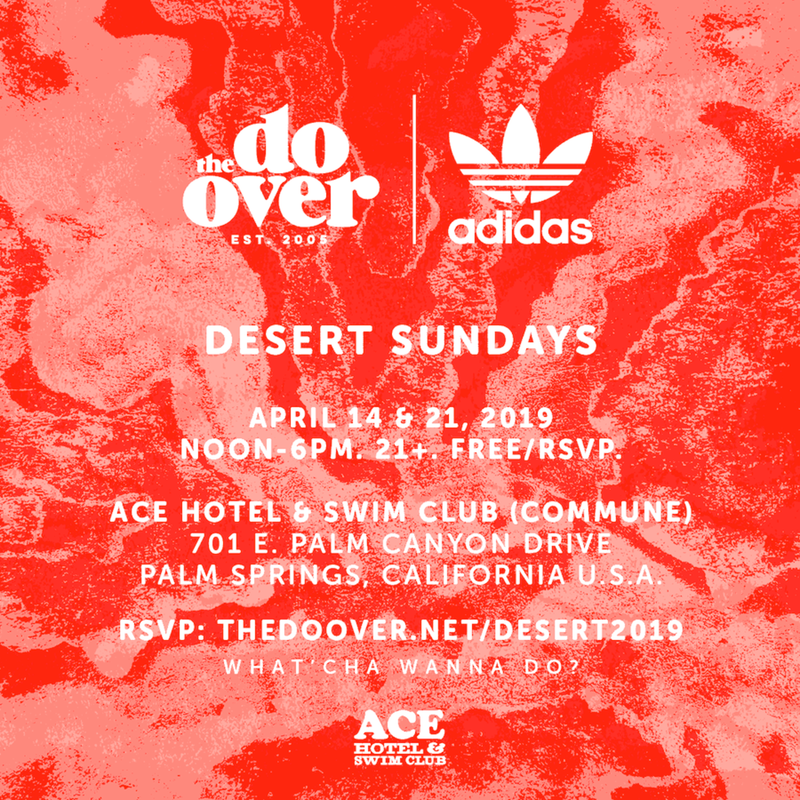 Adidas Sportclub will be returning for weekend two as Soho House takes over on Friday with a brunch as Keep Cool Records finishes up the weekend on Saturday with featured artist performances. Details are still coming in so make sure to keep checking back. a surprising first as the Neon Carnival rides again during stage coach weekend 1. Coachella 2018 Preview: Party Party Parties in The Desert!